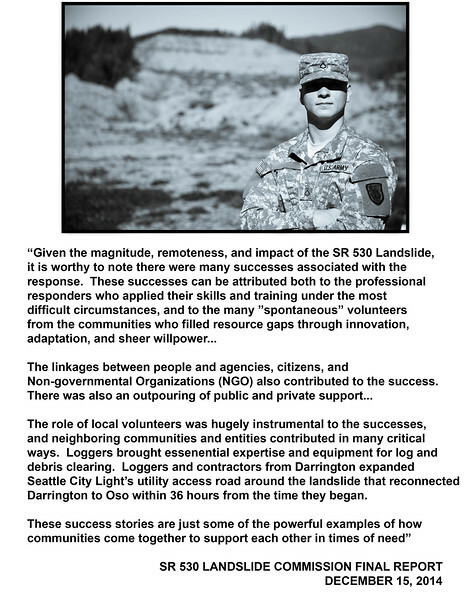 The Oso Landslide Project is a time-based photo documentary project that began prior to the devastating landslide of March, 2014. Photos of the area have been taken in April 2012, March 2013, June and November of 2014, and September 2015. Many of the photographs are large scale panoramics measuring 4 to 5 feet wide in print. The series of photographs were shown at multiple public libraries in the Puget Sound region and at Edmonds Community College in 2015. An associated essay about the project is published on the "Medium" website.